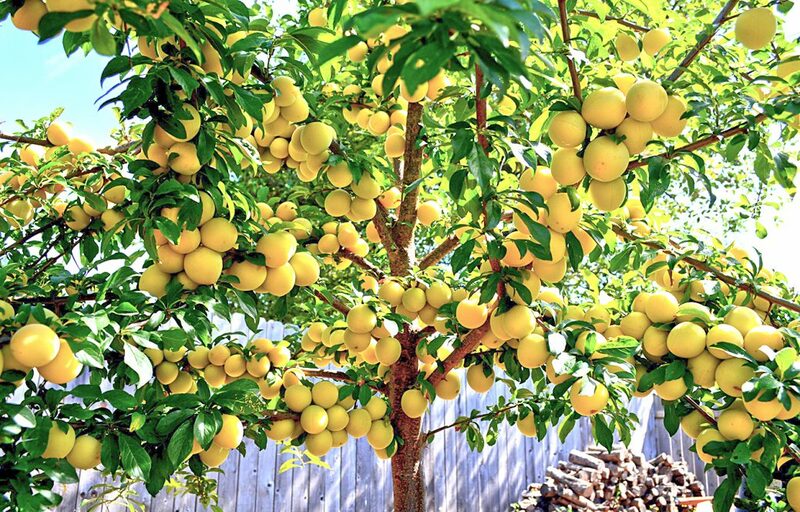 When we planted our golden plum tree last year, we got three plums. 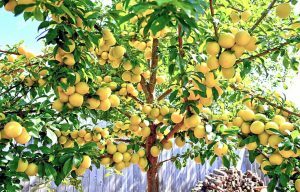 But this year when the tree bloomed, we never dreamed that every tiny blossom would become a golden plum. Not counting what the birds helped themselves to, we picked more than 950 plums off our tiny little tree! We ate plums until we could no longer, then gave bags to the neighbors. After that, it was time to get creative. Here are a couple of recipes that we enjoyed. Cut in half and pit all plums — there is no need to peel, though. Blend halved and pitted plums in food processor until smooth. Transfer to a bowl, and mix in sugar gently. Spread the mix on your dehydrator fruit leather trays (I bought extras online) or line dehydrator trays with parchment paper. Set to the fruit setting (which is about 135° F). 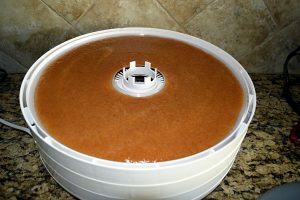 Dehydrate about six hours or until the top is dried and the leather will peel off easily. Do not overdo it, or you will end up with crispy fruit leather. Once done use a pizza cutter to cut strips, roll, and store in an airtight container in the fridge for up to two months. You can add in any fruit to your plums. We also did a berry batch by adding in some of our strawberries and blueberries to the food processor when we were puréeing our plums. Add chopped plums, sugar, and lemon juice to a large saucepan. At the same time get jars and rings boiling in your water bath canner. Heat plum mix on medium until it reaches a boil. Reduce heat to low, and simmer five minutes. Allow the mix to cool, and transfer to a food processor (or in my case, a hand mill). Blend until smooth. 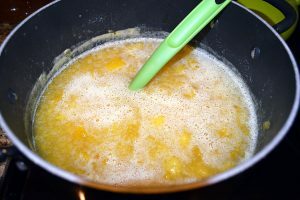 Return the mixture to a boil over medium heat, stirring constantly for five minutes. Reduce to low, cover, and let simmer another 10 minutes. Add pectin, and return to a full boil, stirring constantly for two minutes. Remove from heat. Ladle the mix into hot jars, leaving ½-inch headspace. Wipe the rims clean and seal with lids and bands. 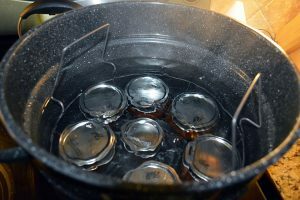 Lower the sealed jars back into the boiling water bath. Process jars in boiling water for five minutes. 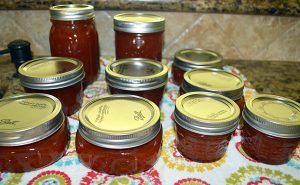 Remove jars, date, and store in cool, dry place for up to a year. I did my plum butter in small gift-sized jars to add to my Christmas gift collection. I love to give a taste of my garden to my friends and family.